With the end of teaching for the semester I’ve taken advantage of the extra time to do a couple of long rides, a 140 last weekend and a 150 yesterday. Over Summer, this was my usual weekend ride but I really wasn’t sure how I would go. The 140 was my long version of the Whittlesea Challenge. I just added on the 30km to get to the start. This was also going to be my first real test of my new crankset setup, switching from the standard 172.5 compacts to a 175 Record Ultra Torque, also compact. The morning started well – didn’t wake Will up, but just before I left it started to rain quite heavily. I don’t mind a bit of rain, but it kept raining for the next couple of hours and this meant I was wet for the whole ride, about 5hrs in all. Thankfully I was warm in my new Rapha Winter kit (boy it’s good!). 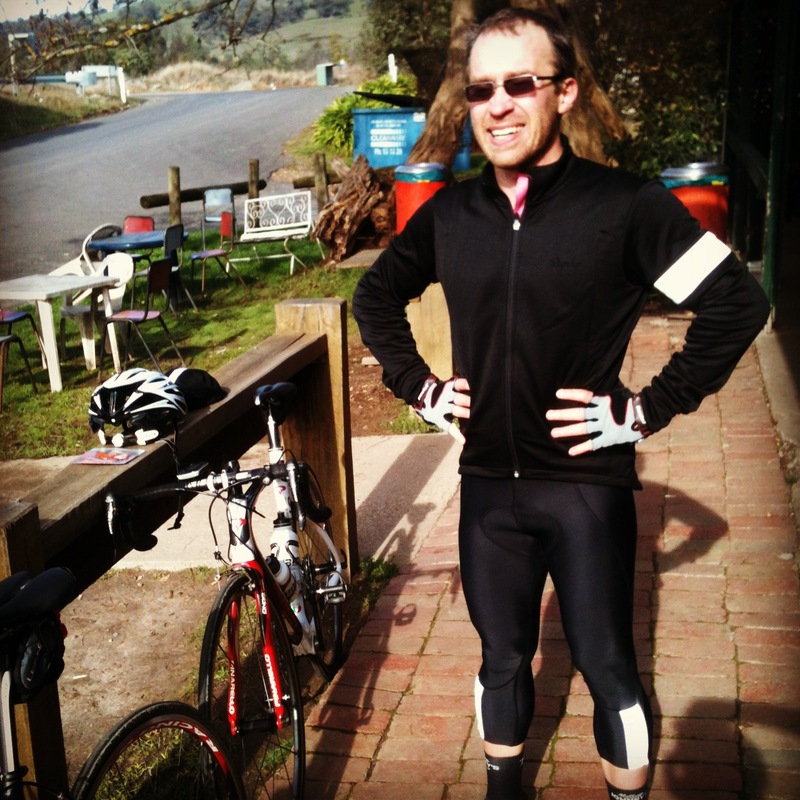 I did feel like I was riding in a Rapha photo-shoot, very gritty but looking good! 10km into the ride and I got that over-comfortable bouncing sensation No! A flat. Bugger. I used the last air in the tyre to get up and over the hill entering Diamond Creek where I saw my mate’s cafe lights on. It was 6:30am but he was there getting ready for the day, so I was able to shelter in the dry and warmth and fix the bike while Mark made me my morning magic. The Flowerdale Hotel, where I would return the following week. From there it was pretty plain sailing for the rest of the ride. The conditions weren’t great for getting super times but we were just pleased with ourselves for getting out there when many, ourselves included, might ordinarily ditch the ride. I felt surprisingly good at the end, though it was certainly enough. While there wasn’t a huge amount of climbing, the wind made us really work to keep a good pace. Still, I was able to assume Dad duty for the afternoon, taking Will out for a drive listening to Kraftwerk’s Tour de France. It’s great for getting him to sleep and it’s good to drive to. Yesterday we had a window of clear weather I seized this to do a 150km loop with another riding mate, Alain. Our route took us up and over Kinglake and through to Flowerdale from where we headed back up to Kinglake West and home through Hurstbridge and Kangaroo Ground. 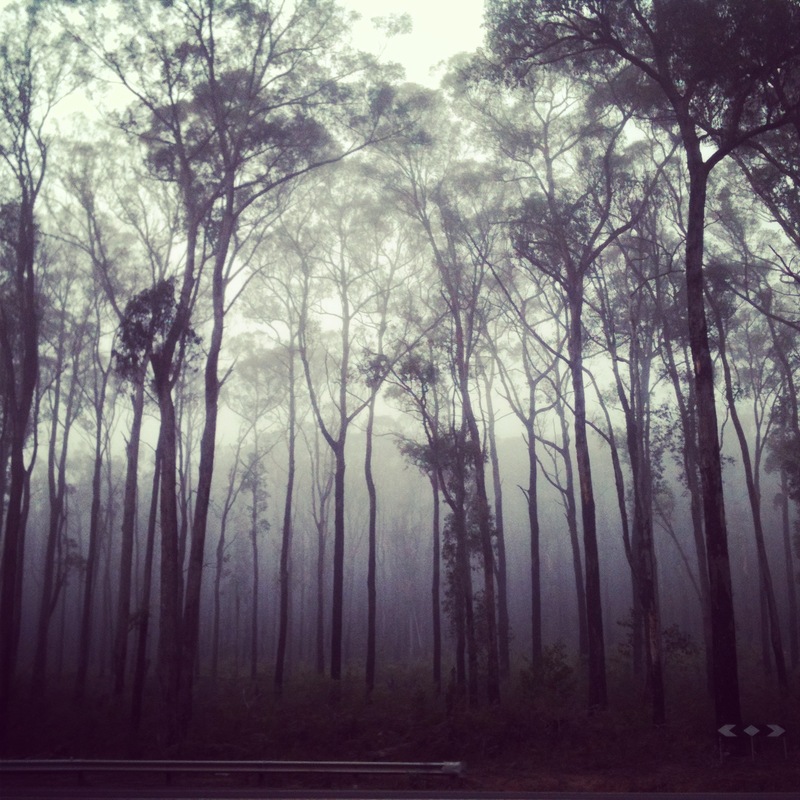 The morning was especially cold, freezing actually, and it got colder, especially on the 7km descent from Kinglake and through the mist and low cloud that had gathered around Glenburn. This part of the country is pretty much just bush and after Kinglake we had to ride another 40km before we would reach Flowerdale where we could get a hot drink. 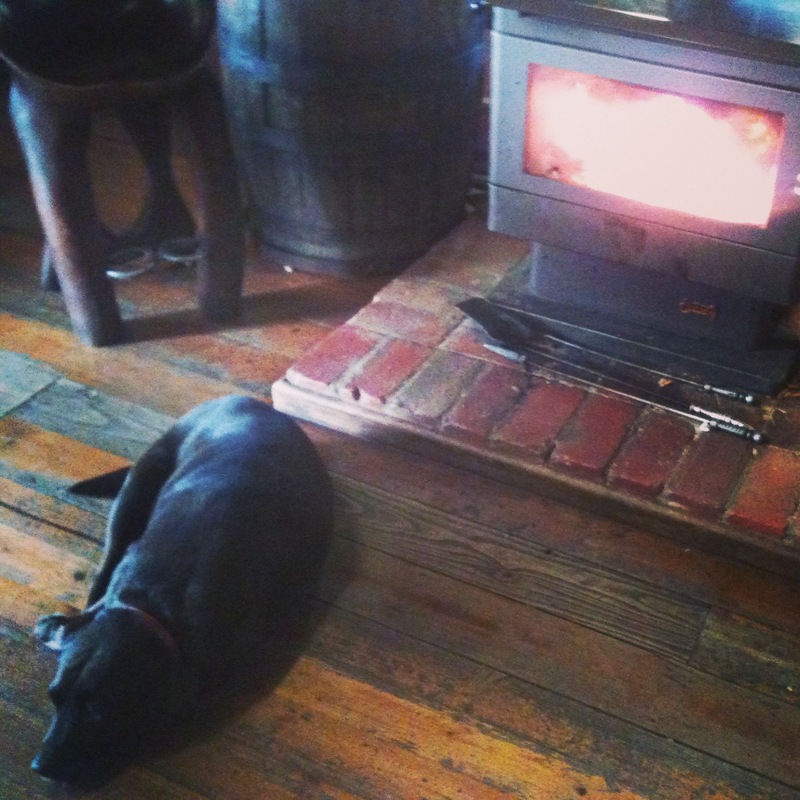 There was a fire going inside which I enjoyed for a moment. By this time the sun was beginning to peak out. For the ride home we had ideal riding conditions: dry, no wind, sunny, so apart from a bit of ‘tude from a couple of drivers we had a perfect ride home. Check out the ride here. So this has been interesting. In spite of not being able to do long rides regularly since Feb., my commutes are between 20 and 60 km, I haven’t lost much form, even over a long distance like 150km with over 2000m. I assumed that I would have lost a lot, and that I’d be in a bit of discomfort. Sometimes it’s nice to be wrong. Last year, around October I think it was, I really stepped up my riding with some specific goals in mind. I wanted to be able to do some big rides like the 3 Peaks and the Haute Route. Well I didn’t get to do the 3 Peaks this year, but about 6 weeks before it, I did complete a 154km ride which had 4974m of climbing. While not as long as 3 Peaks, my ride actually includes 500m of additional climbing! I only saw this last night when Strava corrected my data for the ride. Check it out here. I double checked this on other ride planning software just be sure. 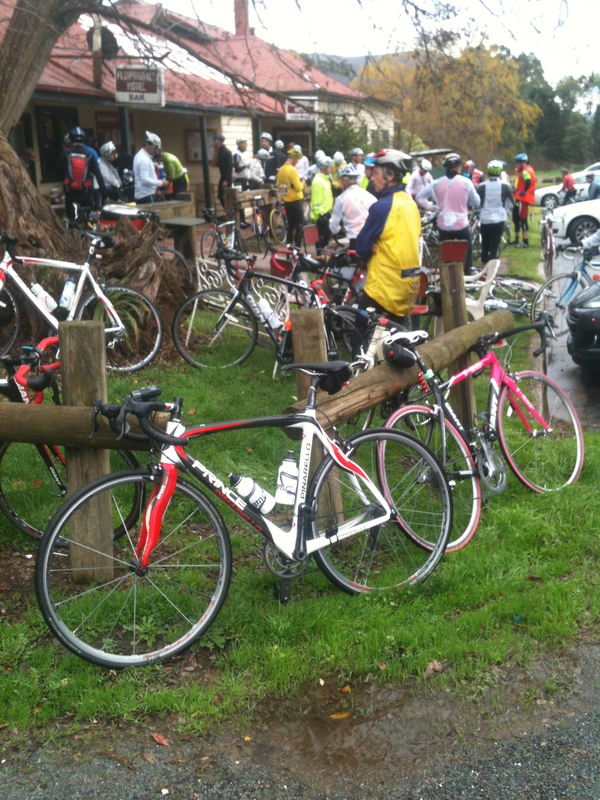 One of my riding mates has just put out the idea of a local 3 Peaks, including Mt Dandenong, Kinglake and Macedon. Something for Spring perhaps. That’s a crazy amount of climbing for that distance, especially considering you don’t ride in the Alps! If you ever get the chance to visit I’ll take you for some good rides. I did indeed read those excellent reports, but I still find it amazing that you can stuff so many vertical meters in there. I’ve never ridden in Victoria, so thanks for the invite. I might take you up on it one day. I look forward to it Gerry. And let me say, that ride pushed me to the limit. I abandoned the last climb with about 700m more vertical to go. I hadn’t planned on it mind you. We were just under the illusion that we needed the extra metres to get over the 3000 mark. Little did we know that we’d passed that hours before! 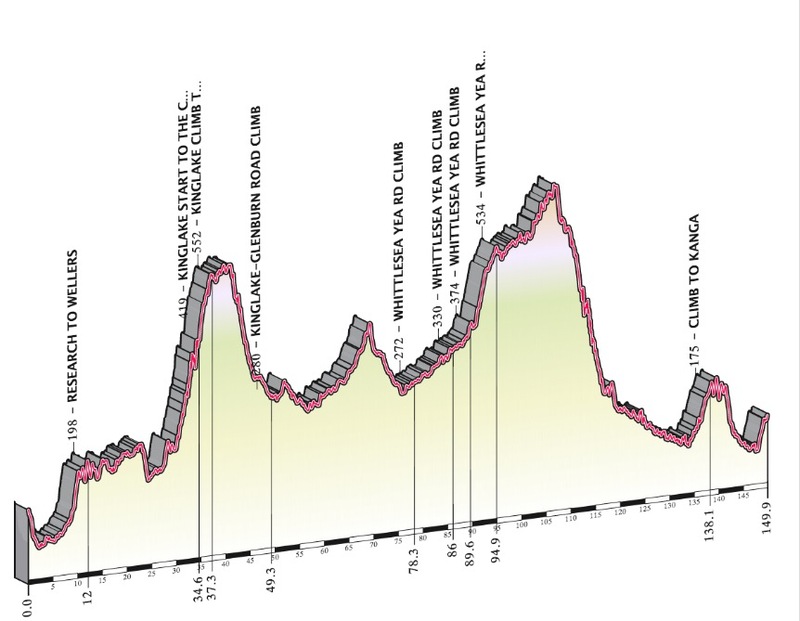 Completing the last climb, which I do want to do, is referred to by some as the Demon Double and for good reason. Remind me not to visit when that event is on! It’ll be a walk in the park after the HR. It’s not actually an event so we’ll do one especially for you!